Twice weekly rehearsals are held on Mondays and most Thursdays in our own band room at Broadwater Park in Farncombe where any player will receive a warm welcome. A selection of instruments is normally available. To access the band room, turn into Broadwater Park and drive past the Godalming Leisure Centre on your right hand side. Continue down the hill into and through the main car park and up the access road on the opposite side. 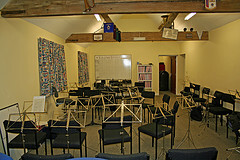 The band room will be in front of you - parking is available next door in our own private car park.